New questions have emerged surrounding a decorated Boston cop's encounter with alleged Boston marathon bombers Tamerlan and Dzhokhar Tsarnaev. 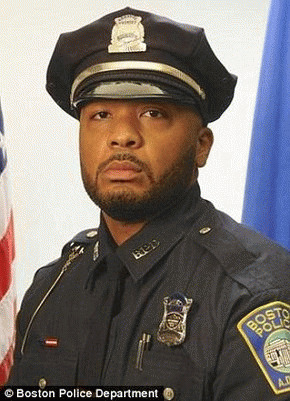 Officer Dennis O. Simmonds, 28, was said to have suffered a severe head injury when the suspects threw an explosive device at him during the Watertown shoot-out of Friday, April 19, 2013. A Police Incident Report first obtained by WCVB news explains how Officer Simmonds responded to an incident in Watertown at 11.40 pm on Thursday, April 18, 2013. During the 'explosive device' incident Officer Simmonds received injuries to his left hand, back and ankle. He also suffered blurred vision, the police report says. However, the shoot-out in Watertown did not begin until 12.45 am, over an hour after Officer Simmonds initially responded, according to the report. The report does not detail how Officer Simmonds was injured, makes no mention of explosives, and does not explain what occurred during the hour prior to the shoot-out. It was filed by Sergeant David S Gavin of the Boston Police Department on May 1st 2013, almost two weeks after the shoot-out which also saw MBTA Transit Officer Richard Donahue injured in a friendly fire incident. The report says Officer Simmonds was transported to Saint Elizabeth's Medical Centre by a Boston EMS unit and treated by a 'Dr Lee' for his injuries. He was sent home with anti-inflammatory drugs and benzodiazepine used to treat anxiety disorders. After being advised to follow up any further problems with his primary-care doctor, he was relieved of his duty by Sergeant Dennis C. Cogavin of the Boston Police Department. It was four weeks before he returned to active service. Officer Simmonds responded to the incident accompanied by three colleagues, Officers Jean Gerard Jean-Louis, Gregory McCormick, and Gregory R. Eunis. All were nominated for a 'Top Cop Award' by the National Association of Police Organizations and were recently honoured at a White House ceremony for their efforts in response to the shoot-out. Officer Dennis O. Simmonds died on duty in April 2014, a year after the marathon bombings and subsequent shoot-out. He suffered a 'medical emergency' during a lunch break work-out and attempts to resuscitate him failed. No autopsy was performed and no cause of death has ever been released. "It is with deep regret that the Boston Police Department announces the passing away of on-duty Police Officer Dennis O. Simmonds. Officer Simmonds was a highly decorated and beloved member of the Boston Police Department. "Officer Simmonds will be greatly missed by his friends, colleagues and all members of the Department." Given the circumstances, is it too much to ask that the Boston Police Department gets its facts straight?